The magic of this game may change the board game industry as much as Dominion did and Magic: The Gathering before that. 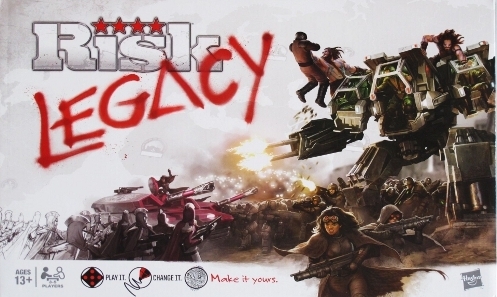 If you don't know yet, in Risk: Legacy, players get to change the board and their factions permanently as the games progress. Players can name continents, found cities, permanently scar the board to give regions advantages and disadvantages, and basically create the experience as they go. It's a stunning coup by Hasbro as takes a relatively simple board game and gives the players a level of investment in replay that I've never seen. And it's a riot, it really is. Each game plays in 60-90 minutes due to the different game-winning conditions and we are excited every time to see how our world will change and develop. There are envelopes that only get opened once certain events happen (like last night when someone was eliminated for the first time) and they add new rules and variation to the game. What's so clever is that last night the player whose faction got eliminated was given a power to make that faction stronger in future games. Permanently. And that player got to choose the power which means he ended up getting rewarded even though he was permanently out of the game. The whole thing was extremely satisfying and the eliminated player was surprisingly happy about it. The only thing I worry about is that the Risk board has it usual issues - the Australian subcontinent is impenetrable and you are prone to a million bad dice rolls - which makes me think that after the first 15 games, once the board is fixed, we may quickly lose interest. But so far it's been an absolute blast! Where else can I at the end of a game, MUCH to my partner Vincent's dismay, found a minor city in the Middle East called "Fagdad". Ha. The Australian subcontinent is now "Vincent is your GOD-Land" with the minor city "Vincopolis". Oh give me a break. Do you get together for games ? Looking for a player ?